There is a beautiful story I read long ago about a wealthy father who takes his son on a trip to the countryside hoping to teach him what it is like to be poor. The father was hoping that his son would learn valuable lessons after seeing how poor people lived. The father sent his son to live on a farm of peasants and after a few days was eager to hear what lessons his son learned. 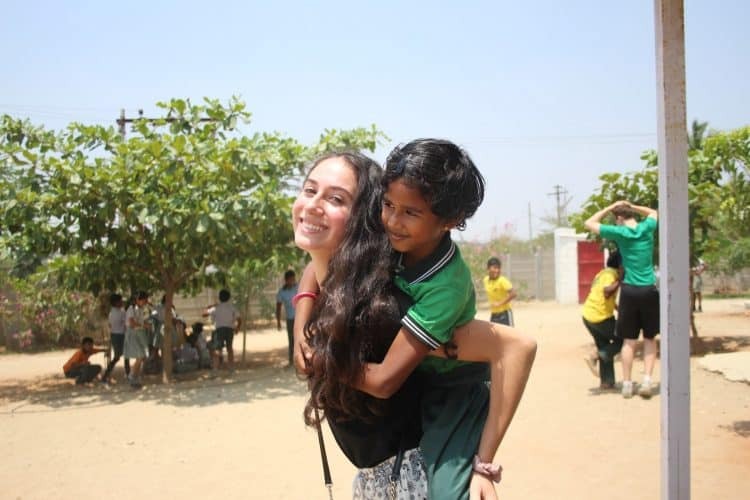 This powerful story hit home for me when my sixteen-year-old daughter went on a service trip to India through Global Pathways. 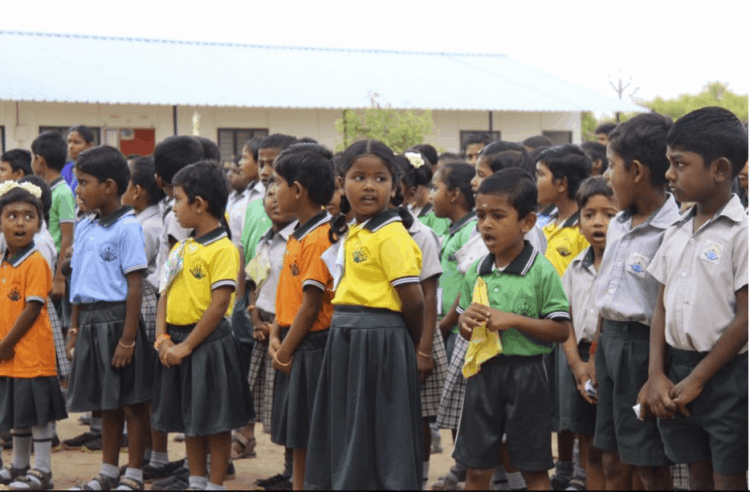 This amazing organization has built a school that helps children below the poverty line and has done wonders for their families by giving them a place to live, work, and the children receive an education, uniform, books and two meals a day. The amazing thing is that it does all of this through donations. As with the story, my daughter reminded me how poor we really are. While we in the West are rich in material things, we are poor in the knowledge and feeling of what true wealth and happiness really are. 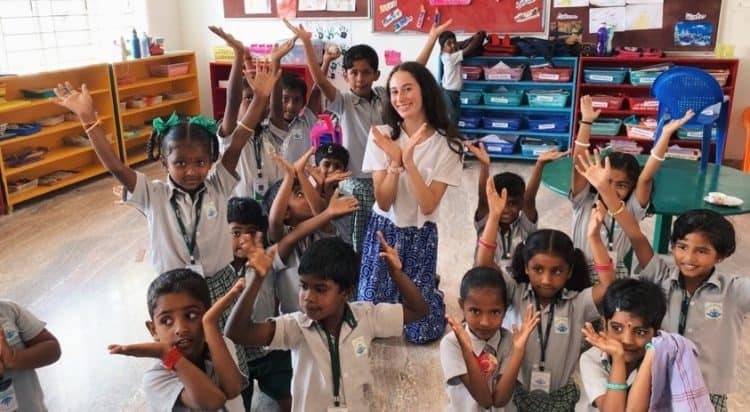 I have to confess when Victoria told me about her interest to be part of the India trip I was hesitant to send her that far and for that long. However, I also knew it was a great experience for her to see how the other side of the world actually lives. I hoped, like that father in the story that she would go and return with a bigger appreciation of the life she has. Now don’t get the wrong idea, my daughter is the most caring and generous person I know. In spite of living a life of privilege, my daughter is conscientious for the needs of others and hence her desire to join the India team. Mom, I now I fully understand that to be really happy, you don’t need much and that to feel wealthy, you don’t need material things. I learned that connection and love can come from the most unusual places and that love is color-blind. It sees no race, age or status. 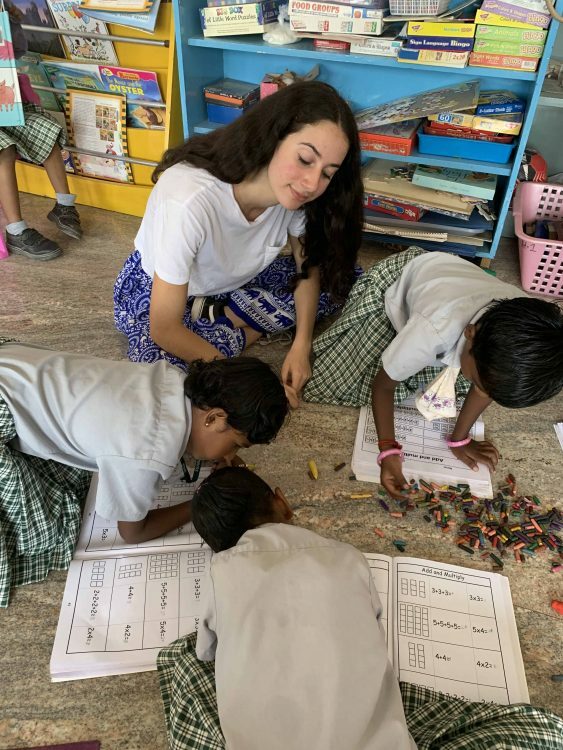 When we first arrived at the school in India, I was feeling jet-lagged and tired, but that disappeared as soon as I saw those amazing children. The children’s’ excitement to see us was overwhelming. In an instant, I was made to feel welcome and at home. Every child ensured I knew how much my presence meant. Through them, I learned that a deep connection with another human being doesn’t have to take time to develop. I now know that time is indifferent and when the connection is real and genuine, it can happen overnight. I was humbled by the children’s ability to accept and connect with me even though I was a stranger. I believe this is something we need to do more of here at home. We are often scared or guarded to truly connect to others and we hold back the gift of truly connecting as human beings. Yet these children taught me so much about that. They would fight for the simple pleasure of holding my hand. I felt special. During the days I was with them, I tried my best to show them how much they mattered to me, but in the end, I came up short. Their love and the emotions they elicited in my heart were more powerful. I saw how materialistic we are that we think we need so many things to be happy, but then I saw these poor children who are happy and you see how they live and don’t have a lot, but that doesn’t affect them. So it showed me that it’s the little things that can make someone happy. It made me more aware about my life. I realized how easily we take things for granted and how we complain about everything when in fact we have so much. Yet, these kids don’t complain. They go about their life feeling grateful. “Happiness doesn’t result from what we get, but from what we give”— Ben Carson. What stood out for me was how generous the children were which was surprising because they don’t have that much for themselves. It’s easy to give when you have abundance, but these kids who had so little offered us the little they had. That was a powerful lesson for me. We often felt bad accepting the little pieces of chocolate they would give us, but they insisted. I quickly realized they knew something special that we were missing. They understood more than us that happiness and true wealth doesn’t come from receiving things. The magic is in the giving. Their faces would light up and I could tell how grateful they felt that they had something to give us. They didn’t care that we had more than they did. That was not what guided them. They were driven by the power to share what they had with us. I am more aware of the resources that I use, like how much or how long I take in the shower knowing how limited their resources are. We take for granted our nice warm showers. They don’t have that yet they are happy — they take a bucket in a communal area and they feel grateful that they have some water and soap to clean themselves. I saw how they value food and they are cautious not to waste. They wash their hands quickly so they don’t waste water and they eat all the food on their plate. In North America, we are a culture of excess and waste. I never thought twice about not finishing my meal and throwing it away. There, if there was a bit left on my plate and they asked me if I was done, I would respond that I was, but they would make sure to signal to me that I had to first finish all of it. I learned that one has to be grateful for the food we have. In fact, after lunch, they have four buckets where people scrape their plates into and they weigh the leftovers. The schoolhouse that has the least waste gets bonus points. So that’s their way to encourage each other not to waste. I now see how we take for granted the convenience of things. For example, we can turn on the tap anywhere and brush our teeth and we don’t even think we can sick from the water. Flushing toilet paper here at home is a privilege the children don’t enjoy and we don’t even think of it. In India, the pipes are so small that if you do flush toilet paper, the pipes get plugged. Here things just pass us by and we don’t notice how fortunate we are. We can eat out, drink anything and you don’t have to be on high alert for your health or fear that things were washed with water that isn’t clean. We don’t even think of that. I learned that a home is what you make of it and has nothing to do with size or luxury. Here we have big fancy homes that we fill with material things, but they often feel empty and cold. We have many rooms and at night, we all close our doors and disconnect. There, they have tiny homes consisting of a single 10 x10 room for a family of six or more. There is no bedroom, dining room or bathroom, just an all-purpose room. Here at home, we sleep alone in big beds and apart from our family members. Over there they have mats they lay on the floor to sleep at night — all together as a family. When you give you receive back tenfold. As Anthony Robbins says, what you give, you get to keep. What you fail to give, you lose forever. The best gift you can give someone is your time. 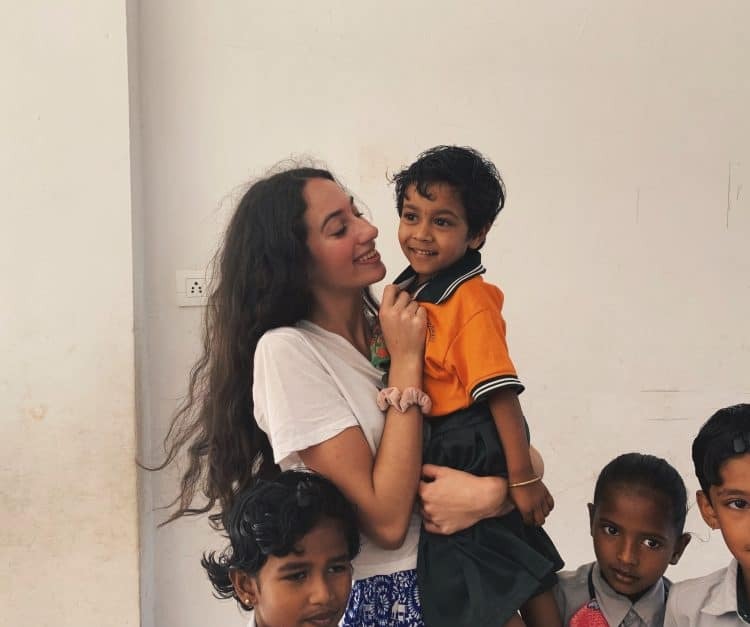 Going to India on this service trip was for us an amazing experience where we learned to give back to those who are less privileged than us. 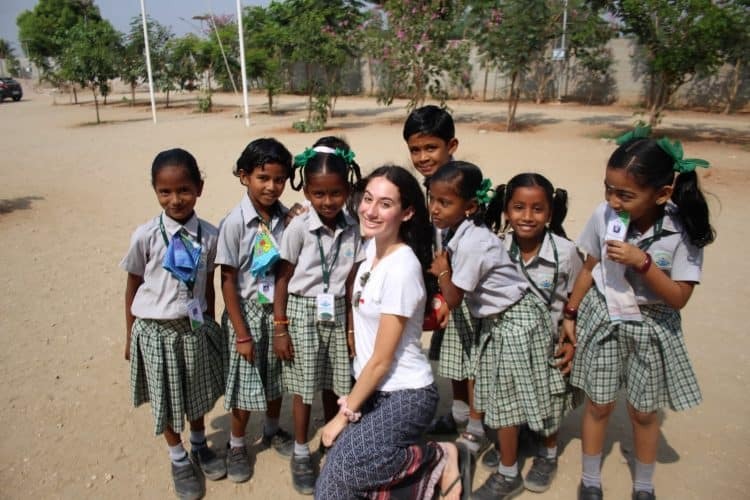 Although our teachers warned us not to think we were going there to save these children or going to change their lives, speaking for myself, there was a part of me that felt or at least hoped that I could in some way, impact their lives. I was so wrong. After I came back people asked me if I made an impact. I answered that I hope I did in some way, I hope that I made them smile, but in truth, they were the ones who left an everlasting impact in my life. 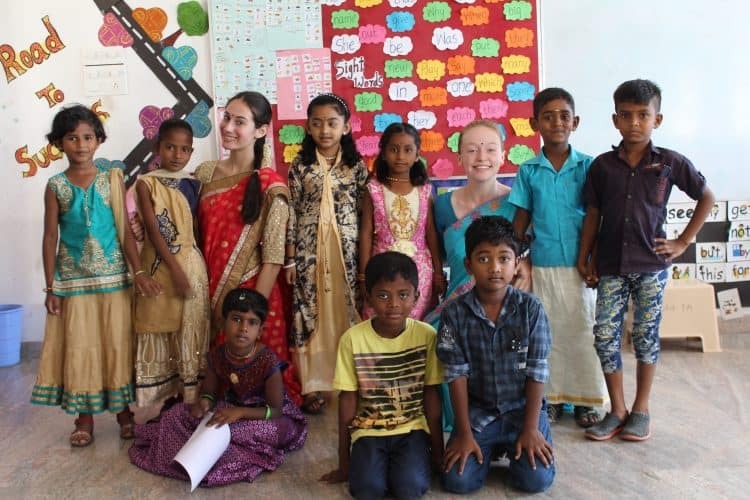 So the trip that began with us thinking that we were going to teach them something, was a trip where we were the ones who actually learned the most from the children. The children were the teachers and we were the students. I didn’t expect that I was the one who was going to receive the help! I was the one who they made happier. I was the one who learned so much from their humility. I was the one who received so much love and affection and experienced firsthand what it is like to have someone like you for who you are. My experience and bond with these children will be something I will cherish for the rest of my life. The children touched my soul in the most significant of ways and they left a handprint on my heart. In reality, this trip was not for them but for me — for all of us for that matter. I can say with certainty that my group of 20 or so feel the same. We bonded and come together for an unselfish cause that gave us the satisfaction that no money can buy. It was these children who made an impact on our lives. It was they who taught us so much about life and true wealth. It was them who helped our souls reconnect. Their kindness and willingness to give the little they had was a profound lesson for all of us. From my heart to theirs I am so honoured and privileged to have seen how the other side lives. With much gratitude Victoria Feldberg. “We make a living by what we get. We make a life by what we give” — Winston Churchill. The lessons my daughter learned lifted my soul. I am imbued with tremendous gratitude, pride, and respect for my daughter. May my daughter’s lesson and insights of connection and being part of something that is bigger than ourselves be an inspiration to us all. What an incredible story & accomplishment! So proud of you Victoria. Truly wonderful to read. We can all learn from Victoria ‘s experience. I look forward to sitting down with Victoria and hearing all about that she saw and learned. What a wonderful lesson Victoria learned, and now shared with so many. Aren’t you glad you allowed her to experience this life changing knowing for herself? This is my favourite post to date. So proud of you Victoria! My dear… just read your recent blog on Victoria’s trip… it is so beautiful and brought tears to my eyes! Truly amazing…. Beautiful, as long as the capitalist model does not crash in and rob them of their wonderful existence. Thank you for sharing. How true it is that true wealth is not in the receiving, but in the giving. Waleuska, Victoria sounds like a very special young lady. We should all learn that lesson. You must be so very proud of her. Que bella y gran ejemplo es Victoria!! to know how to receiv and to know how to give, that is the True Wealth, they are complementar, not dissociated. yin and yang, each has to exist to make the existence of the other one.. … that’s my view. always amazing to discover again and again true values in life, through your experiences or through the people that you love. all good to your daughter and to you. enjoy April, time of spring and big strong energies. That’s what churches tell us, and so we give them our money, but what do they do to actually help the poor people? Their motto, giving is receiving. Ho, that’s how they make their money, along with other money-making schemes. How do you think the religious institutions get so rich, especially Roman Catholic Church! The more you look the less you see! Happiness is in freedom, devoid of materialistic (heavy burden) attachment. As the psalmist says “if i have a wing as a dove, i would fly, fly away, over the mountains (obstacles), over the sea (impediments)”. There is something more than gold(wealth) . There is happiness in simplicity . The peace of mind that surpasses all understandings. The very riches in Christ which He bequeathed to us “MY PEACE I GIVE UNTO YOU, NOT AS THE WORLD GIVETH”. The capitalists, the bigots, the malefactors know no peace for their ‘carmel cannot pass thro the eye of the needle’. The warmongers, the siphoners, the looters, the usurpers who are too greedy to share what they have freely are spiritually impoverished . They can never go near the region of PEACE PROFOUND==> Lk. 16 Lazarus and the rich man. Solemn and reflective Easter celebration to all. God bless you!!! TRULY, this is a lesson everyone needs to imbue and live for their lifetime. A great experience and one I hope you will carry and that will colour your vision for your lifetime, Victoria. It is the best lens to understand the true reality of each human condition. It is wonderful to know you have seen through this lens. I hope the impact is lasting and you can see how you can make a difference every day. Here’s to all you learned and the wealth of understanding you brought back with you. Knowing each of us can make a difference in big and small ways is the most important lesson we can all learn and pay forward. I am so pleased you had a great trip! Here’s to your next one – so you can keep making a difference!